Uccello’s mix of art displays is one of the most intriguing aspects of the building’s grand design. Some paintings appear to be portraits in the style of the Old Masters, but other paintings feature the Specialist Danny “Ruin” Walsh. Ruin can be found brooding on a throne in one painting, and then in another piece, he’s being knighted. The woman who is knighting Ruin looks very much like Savannah Mason; we learned early on from the Specialist HQ missions that she’s the granddaughter of Alex Mason from Black Ops 1. Those missions also tell us that she’s involved in Project Blackout, which seems to be a revival of classic Black Ops characters. The Uccello even has an archway mural of the Construction and Nuketown Island locations from the Blackout map. Why does Ruin get to be immortalised on canvas, and why is Savannah Mason knighting him? Maybe this is nothing more than random art of one of Black Ops 4’s popular Specialists, but it could mean something more. 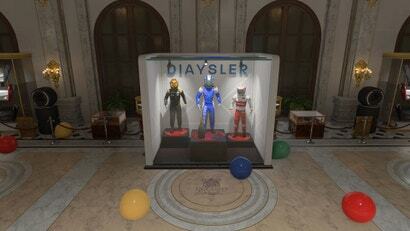 By the way, the other Specialists aren’t completely left out of the casino’s art collection. 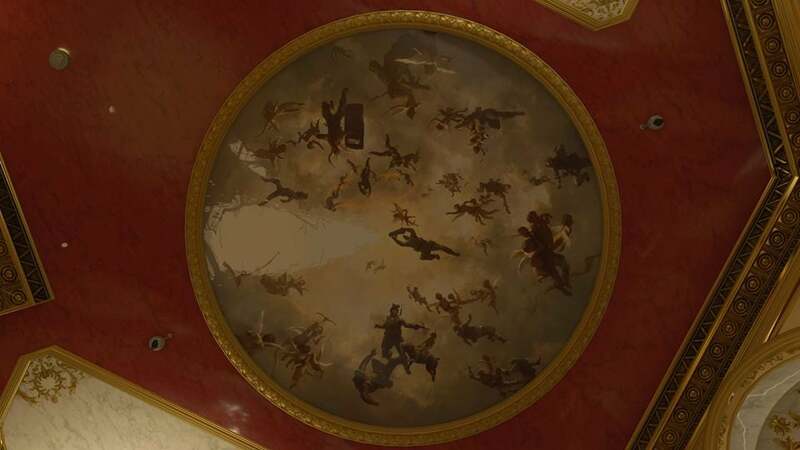 There is an awesome ceiling mural depicting them painted in the style of Renaissance masters like Michelangelo and Correggio. Much like the Blackout archway mural, there’s another archway at the Uccello that is painted with pirate ships and islands. Some of the slot machines even have a pirate or treasure theme. These could exist just to fit the standard casino vibe, or these elements could tease something pirate-related coming in the future. 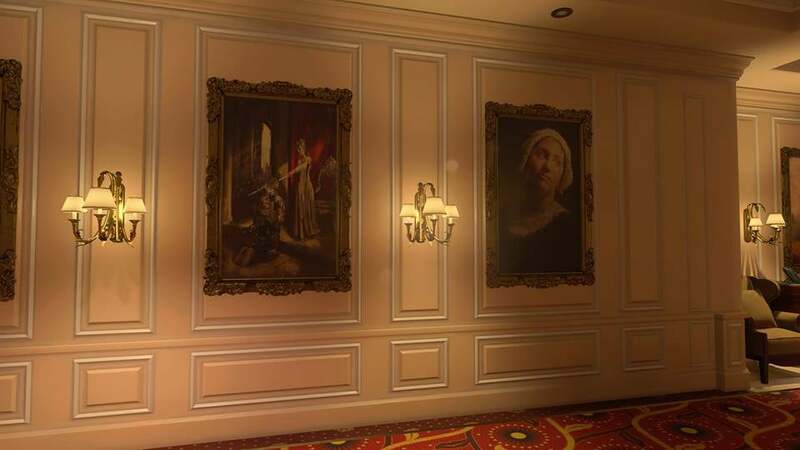 If the pirate mural hints to something coming to Blackout, I can’t see how it would tie in to any Black Ops lore or maps. The closest thing I can think of would be Splash, the waterpark DLC map from Black Ops 3, which I do think would be a fun addition. Lockup’s map locale is a police headquarters in the aftermath of an attack by a criminal organisation. Treyarch designed Lockup to create more verticality with rooftop fights; when I play, I definitely spend most of my gunfights outside the station. However, you’ll get some story clues if you explore the burning interior of the offices, especially if you visit the Investigations area of the building. 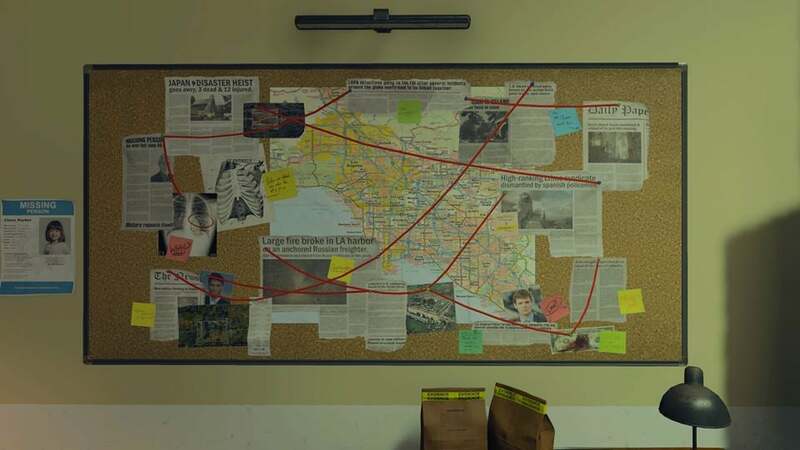 For example, Hacienda is also shown as part of Lockup’s investigation, but that map has an investigation wall of its own. Loaded up with guns and coke, Hacienda is a mansion owned by an unknown crime boss who is investigating attacks against their crime organisation. A ledger from Hacienda looks identical to one found in a room of guns and coke on the Contraband map, possibly tying their organisation to the gun and drug smuggling taking place on the island. The spider web of investigation locations feature various maps from the Black Ops series and ultimately point to a man with an eye patch, and although it’s not definite, that seems likely to be Raul Menendez from Black Ops 2. Menendez continues to rock his eye patch as an unlockable character in Blackout, and he’s also demonstrated as being linked to Savannah Mason according to the audio files unlocked in the Specialist HQ. In the map briefing of Lockup, Treyarch Studio Design Director David Vonderhaar and Producer Miles Leslie explained that they do try to tell a visual story with each new map, but I haven’t found anything within Elevation or Madagascar’s story that could tie them to this increasingly complex Black Ops narrative. Perhaps Treyarch plans to sprinkle more story into this Call of Duty game with no campaign, and if so, I hope that means future DLC maps will give us some solid answers to both Lockup’s major police investigation and Savannah Mason’s Project Blackout, which seemed to revive some of Black Ops’ most OG characters.